Yes, I was especially concerned for this little guy. He seemed to be having a hard time perching on the branches and was doing a lot of fluttering around. I’m guessing he was either too young or too sick to make the trip south, which makes it even more surprising that he would have survived this long into such a severe winter. 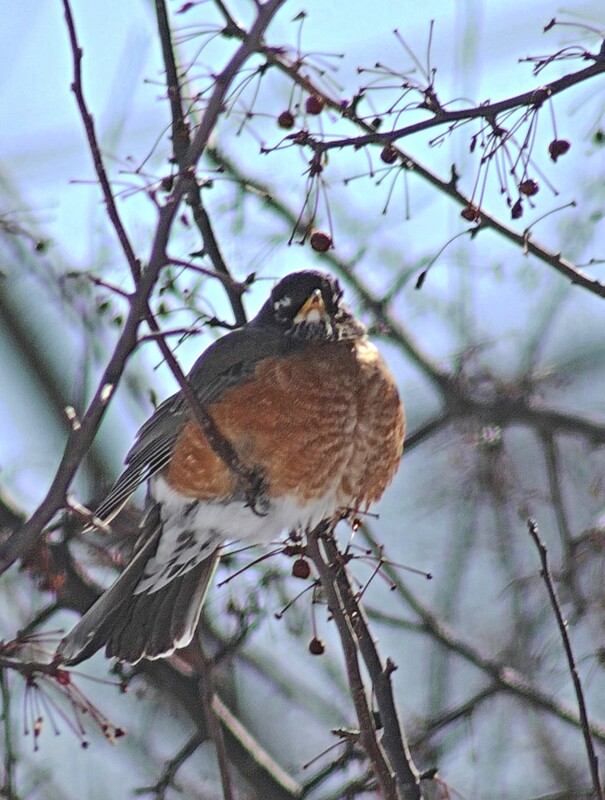 We spotted robins several weeks ago. They either came back way too early, or never left in the fall. I too wonder how all the little critters survive the harsh weather. 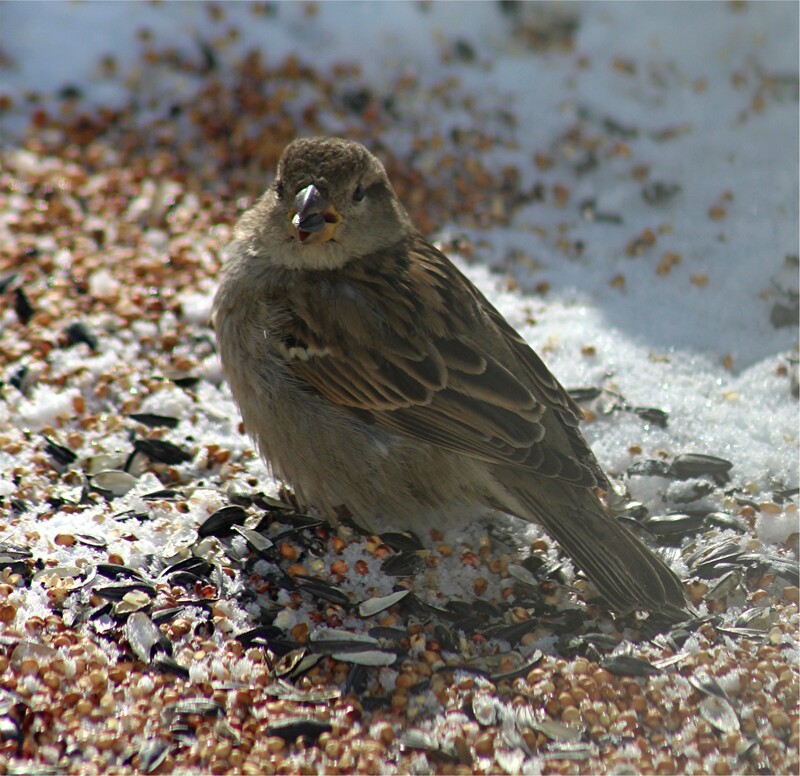 We keep our bird feeders full and fresh water available. I can’t even get to my bird feeders so I had to clear a space outside the back door. Judging by all the tracks, quite a few creatures other than the birds have taken up the offer of food. I saw two rabbits out there a couple of evenings ago. I think every little bit helps. Rabbits visit our platform feeder on the ground often at night. Thank you, Diana! I was more than happy to provide the food and was glad that they took me up on the offer, even though most of them came at night when I couldn’t see them. 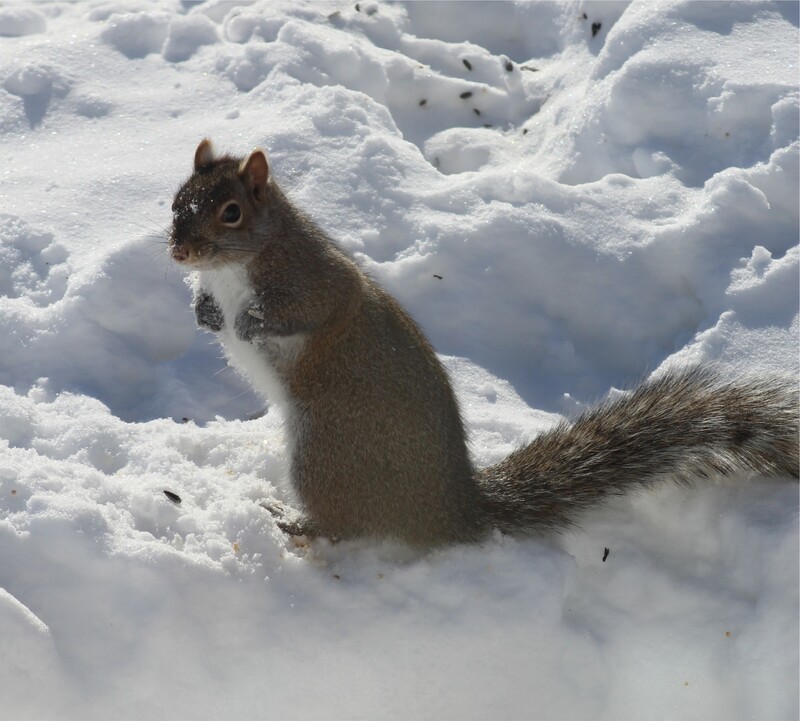 Everything looks so jolly cold especially the squirrel …needs little hand warmers! Stay warm! How funny! My Mum would have been the first to knit him a pair, or two pairs. She always enjoyed a knitting challenge. Things are starting to thaw out a bit now so I hope to get out and about soon in search of new pictures. Daughter like mother then as you certainly like challenges! Pleased to read that there’s a thaw coming your way. Thank you so much! It’s amazing how we can adapt to such extreme conditions. 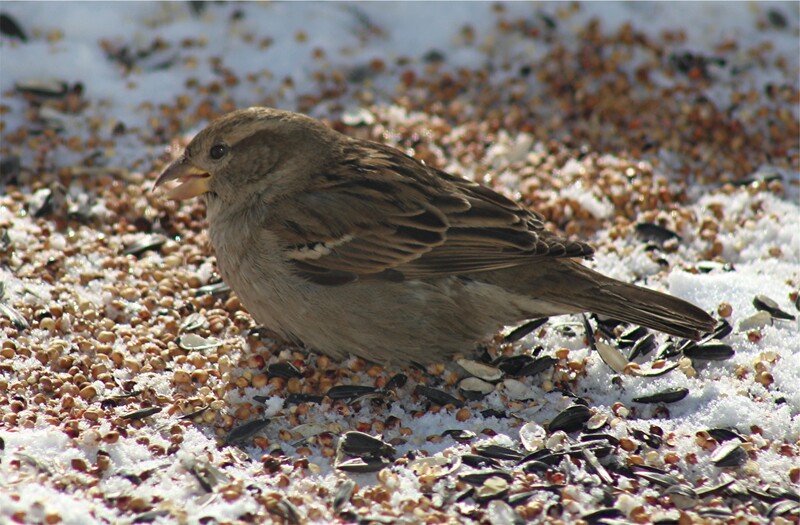 The sparrows certainly seem to have figured it out. Better days ahead, thank goodness! 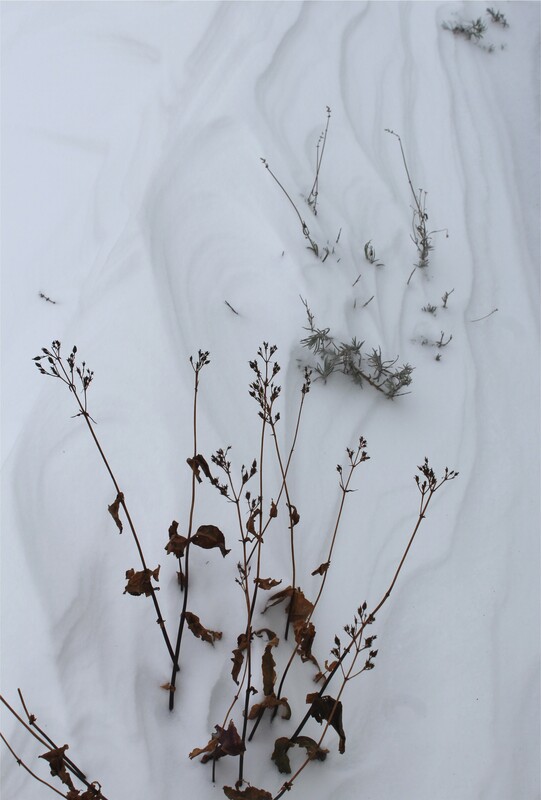 Really loved that last photo where the tips of the plant look like a group of miniature trees! Both of us loved it.. made Nigel think of a group of trees on the savannah! Thank you, Liz! 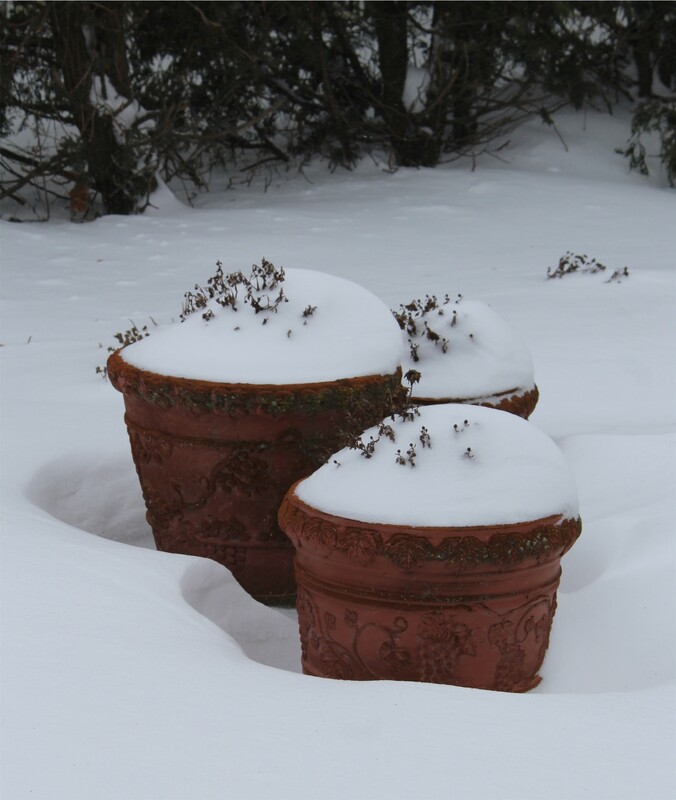 I did think it looked rather like a little oasis in a desert of snow. Beautiful photos. Look at all that snow. It just doesn’t seem to want to sit in London this year. It sounds bad in the US though. Thank you, Gavin! We have become accustomed to seeing more than a foot of snow every winter but the cold has really been brutal this year. Still, no matter how much we complain about the weather, once the sun comes out and things warm up a bit, all is forgotten. That is always the way. It seems to be Man’s way to complain about the cold, until it gets too hot…. Thanks, Indira! The snow is nice to look at when it first falls, but now it’s starting to get really messy. Perhaps the rain will wash it all away. Then we can start again. Oh that poor little robin. I’m glad you have a little fruit left on that tree. Nice photos! Thank you, Annie! I’ve been looking out for the robin but haven’t seen him since that day. I hope he survived. The birds look very plump and well-protected! Your windows are remarkably clean. Nice shots! Thanks, Patti! 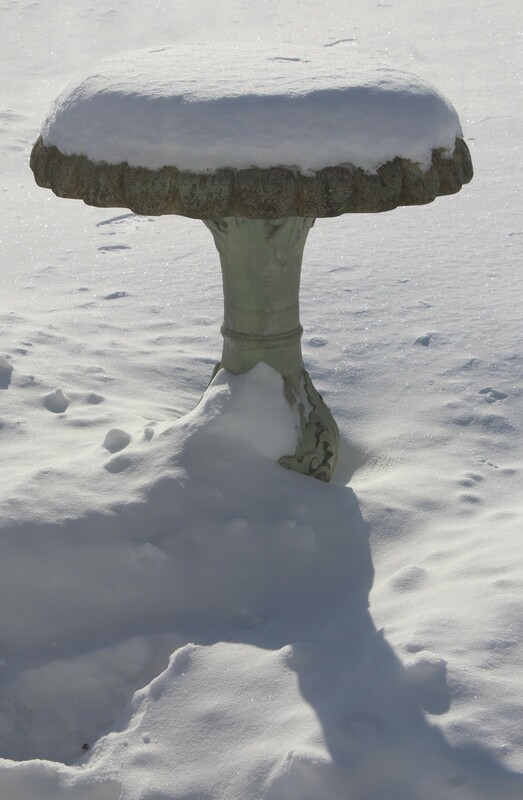 The birds seem to have a way of puffing up when it’s very cold. It must help so maybe I should try it. Haha! The windows only look clean because the long lens focuses out all the marks.